The Gardiner grappler finished second at NHSCA Nationals in the 113-pound weigh class. Peter Del Gallo had hoped for a better showing at this winter’s New England High School Wrestling Championships. 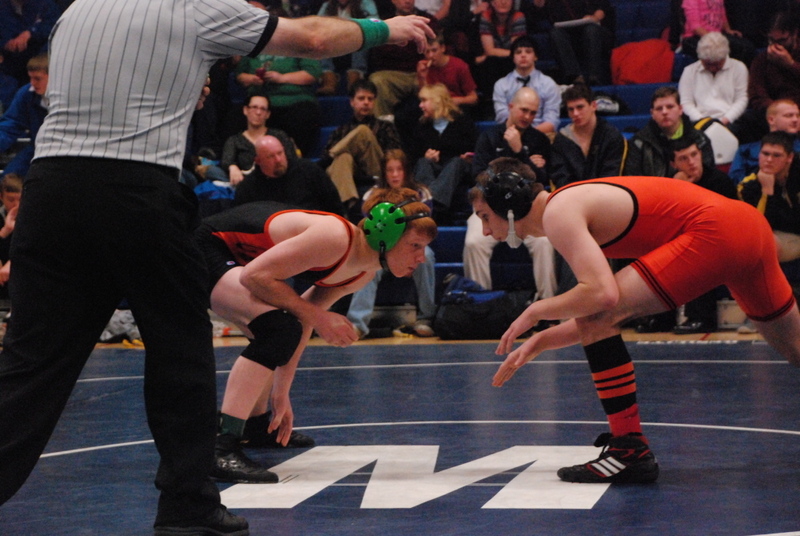 A Maine and New England champ in the 106-pound weight class as a freshman, the Gardiner High School sophomore was looking for a similar performance after taking the state title at 113 a few weeks prior. Unfortunately for the Tigers’ sophomore, he came out on the wrong end of a couple close matches and settled for fifth. For most wrestlers, New Englands marks the end of the wrestling season, but for Del Gallo it served as a springboard towards success — not that he hadn’t enjoyed plenty already in his young high school career. This past weekend he traveled to Virginia Beach, VA for the 25th Annual NHSCA High School National Wrestling Championships, and came away with an impressive runner-up performance at 113-pounds in his age group. Del Gallo fell in the finals 4-3 on a last-second reversal against Missouri Class 2 champion Josh McClure, who went 34-0 this season. Del Gallo was taken down in the opening period to fall behind 2-0, but quickly earned an escape in the second to cut the deficit in half. The Gardiner sophomore continued to push the pace, and managed to get a takedown before the end of the period to take 3-2 lead into the third. McClure chose down looking to get an escape to tie the match, but Del Gallo rode out the Fulton, MO grappler to maintain his lead. Unfortunately for Del Gallo, the National title was not in the cards, as McClure hit a Peterson Roll with just two seconds remaining in the match to turn a one-point deficit into a one-point lead for the 113-pound championship. While the result was not what Del Gallo had hoped for, it was nonetheless an impressive turnaround from New Englands as he put on a show in the opening rounds at the Virginia Beach Convention Center. Del Gallo opened the tournament by demolishing Sean Watson of Chaminade High (NY) 16-1, trouncing Thomas Worthington High’s (OH) Tyler Norris 9-1 and rolling over Isaiah Whitley of Davie High (NC) 16-0 to make the quarterfinals. In the quarters Del Gallo was tested for the first time in the tournament, as he battled Suffolk Division I champ John Arceri of Huntington High (NY) to a standstill through the first period. Arceri chose neutral for the second, but it was Del Gallo that got the upper hand with a takedown. He later doubled his advantage with a reversal in the third for the 4-0 victory. The semifinals proved to be more like the first three rounds for Del Gallo, as he crushed Ozzy Lugo of South Dade High (FL) 16-0 to book his date in the finals. While the trip didn’t end with a championship, it was an experience both he and Gardiner coach Matt Hansen believe will do wonders for his confidence when he returns to wrestle in Maine. Only a sophomore, that next level is still a ways away, and for the time being Del Gallo’s focus is on becoming even better. He says he intends to next wrestle at the Empire Nationals Wrestling Festival Saturday, April 12 at the Brockport State Athletic Center in New York, as well as a handful of other tournaments during the spring and summer. The goal will be to make a similar move in weight class by next season to the one he did this past winter. No matter what weight class he ends up settling in, it seems like the Peter Del Gallo’s best days still lay ahead.